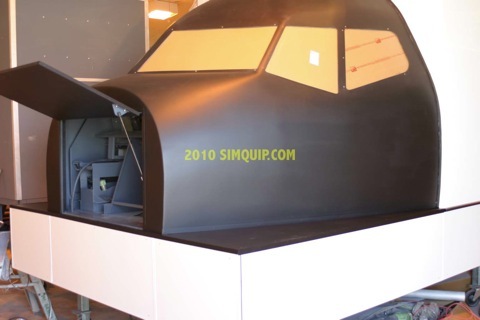 Since 1998 Simquip have been delivering fibreglass enclosures for simulators. As tempting as it may seem, the purchase of a real aircraft shell is fraught with many problems and costs. There are issues such as stripping out redundant wiring and general preparations for compatibility to a Simulator application. Our Fibreglass shells makes having a ready to fit out simulator easy and a lot cheaper than you would think. The shell arrives complete and ready for action. Once it has been un crated and removed from its shipping pallet, you can commence of fitting out your simulator. With more than 55 units delivered world wide, our enclosure has been an outstanding success and the basis of many simulators. Other cockpit/nose section kits often look like the bride of frankenstein once assembled with weird sharp angular lines, but our ready to roll shell comes as a beautiful, smooth nose section that looks just like Boeing intended. Because of its strength, resistance to dents and insulating properties, Fibreglass is by far the best material to construct a flightdeck shell from and is used by almost all simulator manufacturers. 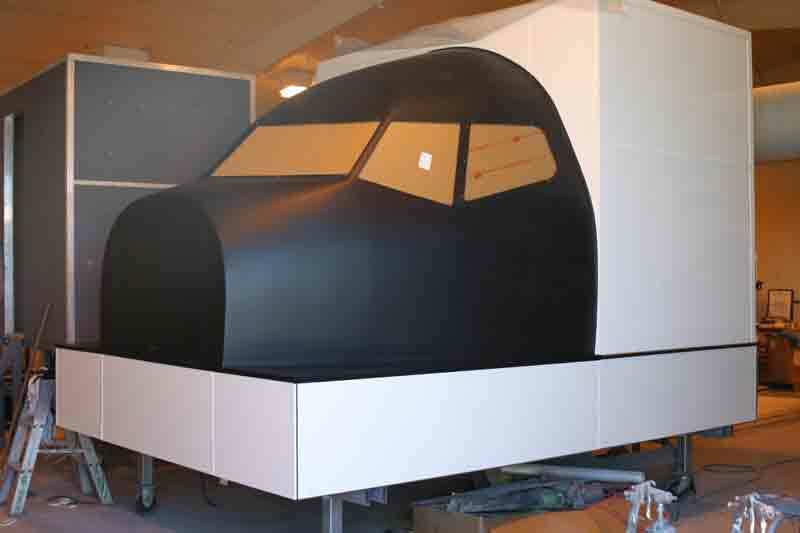 We offer some important options to fast track the completion of your simulator. 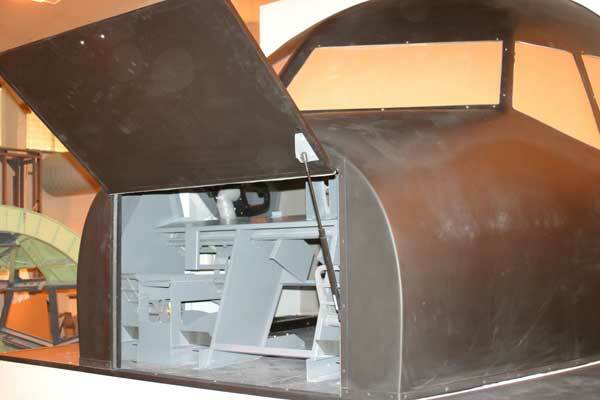 The shell requires substantial space as it is a 1:1 representation of a real aircraft nose section. Actual aircraft shape and size guaranteed. Shipping can be costly unless empty space is filled with other parts (then shipping cost of shell is offset by shipping extra parts for free). 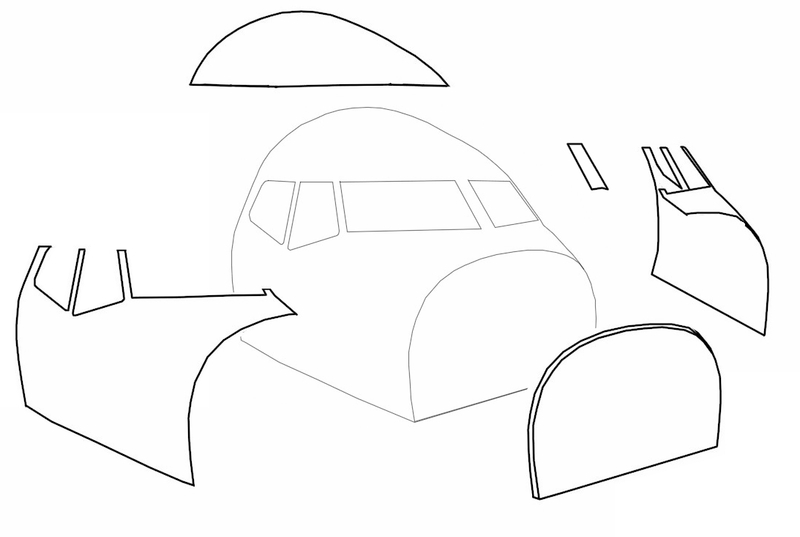 Shell will require a large area with the same space required for an aircraft nose section. 2-4 persons needed to move shell. Options include; RIBKIT Our RIBkit replicates all of the ribs and internal hardpoints throughout the flightdeck. Once fitted, this makes installing liners, swinging panels and many other furnishings and fittings infinitely easier, not to mention the savings in time and installation costs.Essentially the ribkit allows you to navigate the fitting points of the flightdeck accurately.We also offer an optional ribkit installation service that removes approximately 48 man hours from construction. This option is highly recommended for constructors. The other benefit of the ribkit is that increases the rigidity of the flightdeck immensely.To see the ribkit click here WINDOWKIT Once installed the windowkit adds surprising ambience to the shell as well as helping to contain any environmental enhancements including airconditioning and audio. The windowkit consists of all window panes in including eyebrow windows that are simply bolted to the cockpit shell these panes comprise of custom cut 1/4" acrylic sheet secured with countersunk bolts for a flush finish. The windowkit includes everything needed to install the windows, including; counter sunk bolts and nylocs, adhesive foam sealing, drill and countersink tool. If you want the shell delivered with windows installed there are options to have the windows cut out and to have the windows fitted before it leaves our factory. Please note that the windowkit does not include the DV windows. These can be purchased separately. You have 3 choices here;gloss white, gloss black or matt black.Except for the matt black, these are no-cost options to suit your application. Matt black is highly recommended for constructors intending to install a visual system.Gloss white is surprisingly the most easy colour to maintain and keep clean. To produce a shell of any colour takes 7 days. To manufacture and install a ribkit takes 4 weeks. To supply a ribkit un-installed takes 3 weeks.If you need the option of a segmented shell please add 2 days to the standard delivery time. Contact us prior to ordering for a delivery quote to your location.